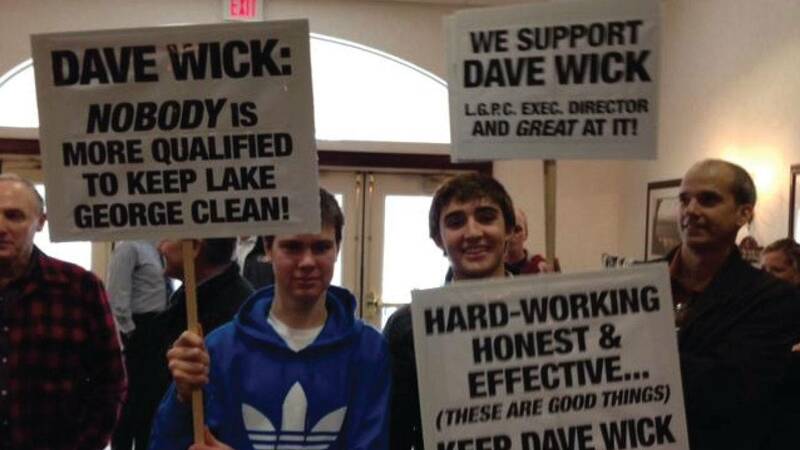 Around 100 people filled a room at the Fort William Henry Conference Center to support Dave Wick, the embattled Lake George Park Commission's Executive Director. Last week North Country Public Radio broke the story that the Cuomo administration was trying to oust the popular figure, who this summer launched what was deemed a successful boat-washing program to protect against invasive species. Wick's wife Kim confirmed to us that her husband was asked to resign from his post last week. He is currently on paid administrative leave. According to multiple media outlets, at issue is the fact that Wick allegedly spilled a gallon of gas while at a state-owned dock on the lake. DEC officials, who were reportedly on-hand, helped Wick in the clean-up. Wick allegedly never reported the spill to the DEC, which is part of protocol. Bruce Young, the chairman of the commission, admitted it is unclear what will happen next. UPDATE - Shortly after posting our story, a Glens Falls law firm emailed New York NOW correspondence between the Inspector General's office and the commission. A letter was hand-delivered letter by the IG to Young on Monday. There is no mention of the gasoline incident in the three page report. Instead, it details that Wick violated the New York State Public Officer's Law as well as commission policy and procedures as it relates to prohibition of gifts. The report says Wick and several commissioners met with a member of the Lake George Steamboat Company for the purposes of planning a retirement cruise for outgoing commissioner Ton Conerty. Following the conversations, the company agreed to donate the use of the boat, hors d' oeuvres, open bar and a disk jockey. Attendees paid $30 for the cost of dinner and the cruise. The owner of the company admitted he donated these items, noting that Commissioner Conerty was a friend. The normal cost of the boat rental per hour is $850. The boat was used from 6:30pm to 10:00pm. Wick testified to the Inspector General that he notified all the commissioners of the donations and not one voiced concern or objected. Finally, IG Catherine Leahy Scott recommends that commissioners attend training by their office and of the Joint Commission on Public Ethics (JCOPE) and that it will review all of the commission's bylaws. Lastly it says the commission should "take appropriate disciplinary action against Mr. Wick." The letter also states that the matter is now being referred to JCOPE. "After reviewing the findings of the Inspector General, the Lake George Park Commission today suspended Executive Director Dave Wick for two weeks without pay. Mr. Wick is expected to return to his position on December 10, 2014. The board takes the findings of the Inspector General very seriously. The Commission will implement all recommendations of the Inspector General, including undergoing the appropriate ethics training in the coming weeks. With these actions, the Commission feels this matter is now resolved. The Commission appreciates the support from the community both for Mr. Wick and for the Commission’s mandatory boat inspection program. The Commission looks forward to the continued success of the program with the continued cooperation of the State of New York, the SAVE Group and all other concerned parties."